I picked agriculture as my Pagan Blog Project "A" topic because growing my own food helps to keep me connected with the universe and the local spirits. It also fits in neatly with last month's "Z" post about finding magic and mystery in the mundane. When I prepare my garden I speak to the spirits of the land. I whisper words of strength to the seeds as I plant them. I give thanks to the plants as I harvest them for the life that they give to me. It is a mystical experience and I hope it always will be. A lot of people my age and younger have never grown food for themselves. I've been lucky to have grown up with a garden. My father was the son of a farmer and we always had at least a small garden. Now I have a daughter and I will pass along this tradition to her. 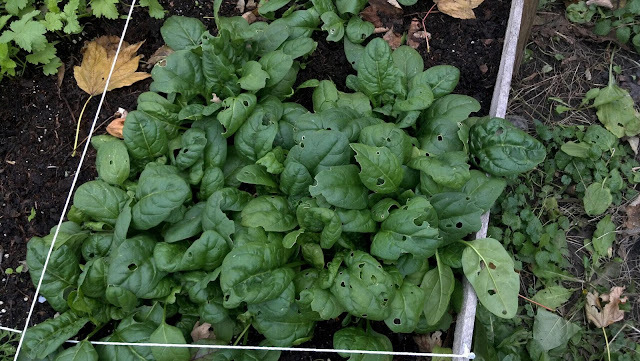 Below is a picture of spinach growing in the raised bed she "helped" me build last year. Spinach is a winter crop and it grew until we got almost a foot of snow a couple of weeks shoo. It doesn't matter who you are, if you trace your roots back far enough you will find a farmer. Creating a garden can not only help you connect to the land, but it can also help you connect to your ancestors. I find that my garden also helps me to connect with my faith. Many pagan religions are earth religions. The major festivals and holidays revolve around agriculture. 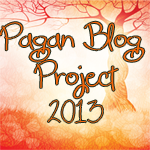 As an example, I will use festivals that most on the Pagan Blog Project will be familiar with. Planting is done around the three fertility festivals of Imbolc, Ostara, and Beltane. Fruits and vegetables will be ready for harvest around the three harvest festivals of Lammas, Mabon, and Samhain. Aside from the spiritual benefits of having a garden, there are practical benefits as well. Growing your own food can be a lot cheaper than buying it in a store, and better for you too. Plus there are the additional health benefits of being outside working in your garden getting fresh air and sunlight. Even if you don't live where you can plant a garden in the ground, you can still grow things. I've seen gardens grown on rooftops, balconies, and window sills. If you are new to gardening, start small and with something easy, like garden herbs. I really enjoy my garden and I hope I inspire you to start your own. Remember to always find the magick in the little things. I'm in the planning stages for our garden this year! Do you grow herbs also? I do grow herbs as well. I have sage, thyme, oregano, basil, and rosemary. I love that we are teaching our daughter to respect nature and growing our own food. We can teach her graditude through all things in life and respect for God and Goddess everyday! Oh this had me yearning for warmer weather. I have so much work to do with the gardens and I am looking forward to it. There is something fulfilling in working the land and being part of it that perhaps one can only experience if the task is undertaken. I used to hate it, now it is sometimes in my dreams! You spinach gives me that winter planting itch! I a trying with all my might to divine a way to keep my crops from being eaten by rabbits, deer and groundhog without building a bunker over my garden, as many here have to do. I live in the city, so I don't have to contend with the local fauna. Good Luck! This past week my family has been eating from the food lovers cleanse diet recipes from bon appetit. (I talked my teen aged son out of juicing). I immediately thought of your paper after my experience in the groceries. There isn't any process food in this diet. My husband and I went to Krogers and we started loading up on fruits and vegies to make the recipes. The grocery cart was more loaded than usual and I was anxious about the bill at the check out line. The bill came out the same. This has been a big discussion at my house. Thank you so much for nominating me for this award! My acceptance post is coming soon. A quick update, the snow has melted and my spinach is still gowing strong! It may survive the whole winter. This is my first time planting it as a winter crop, so we will have to see.